Causal broadcast is a classical communication primitive that has been studied for more then three decades and several implementations have been proposed. The implementation of such a primitive has a non negligible cost either in terms of extra information messages have to carry or in time delays needed for the delivery of messages. It has been proved that messages need to carry a control information the size of which is linear with the size of the system. This problem has gained more interest due to new application domains such that collaborative applications are widely used and are becoming massive and social semantic web and linked-data the implementation of which needs causal ordering of messages. This paper proposes a probabilistic but efficient causal broadcast mechanism for large systems with changing membership that uses few integer timestamps. 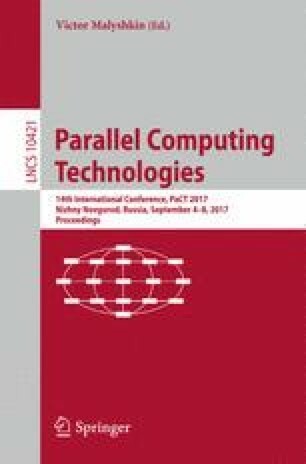 This work has been partially supported by the Franco-German DFG-ANR Project DISCMAT (40300781) devoted to connections between mathematics and distributed computing, and the French ANR project O’Browser (ANR-16-CE25-0005-01) devoted to decentralized computing on networks of browsers.